Posted on Tue, Feb 21, 2012 : 2:55 p.m. The University of Michigan's Technology Transfer Office served as the model for a new initiative with six other Michigan public universities to accelerate technology commercialization by connecting entrepreneurs and experts to ideas and intellectual property. 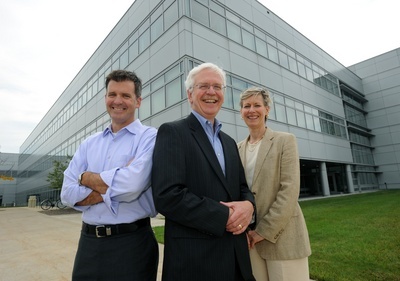 U-M Technology Transfer Office executive director Ken Nisbet (center), Michigan Venture Center director Jim O'Connell and Tech Transfer licensing director Robin Rasor. With a grant from the Michigan Economic Development Corp., U-M formed a $2.4 million program called the Tech Transfer Talent Network. Other members of the initiative are Wayne State University, Michigan State University, Michigan Technological University, Western Michigan University, Grand Valley State University and Oakland University. The university said it would leverage existing resources and strategies employed by the U-M Tech Transfer Office to help its partners launch similar initiatives. For example, a U-M database called Catalyst, which lists private-sector entrepreneurs who have expressed a willingness to assist university innovators, will be repurposed for other universities. In addition, the new Tech Transfer Talent Network will help universities form programs similar to U-M's Mentors-in-Residence initiative, through which entrepreneurs help assess market opportunities for university IP. "The primary goal of the Tech Transfer Talent Network is to increase the supply of seasoned entrepreneurs and innovators who can lend their expertise to university tech transfer offices," U-M said in a news release. "These connections will serve as important bridges to launch technology-based startups or license university inventions to established companies. The program will allow other state universities in the network to share and benefit from the tech transfer resources developed at U-M."
Ken Nisbet, executive director of the U-M Tech Transfer operation, said university innovators need help to develop their ideas and IP into products. "You may get early stage internal development funding, but if you cannot find the talent to assess commercialization issues, formulate development plans and execute on these plans, you're not deploying that money well," Nisbet said in a statement. Tue, Feb 21, 2012 : 11:41 p.m. This is great news !!! The taxpayers are finally going to reap their just rewards as one of the principal partners in this endeavor. I hope our interests are properly being addressed along with the rest of our partners.